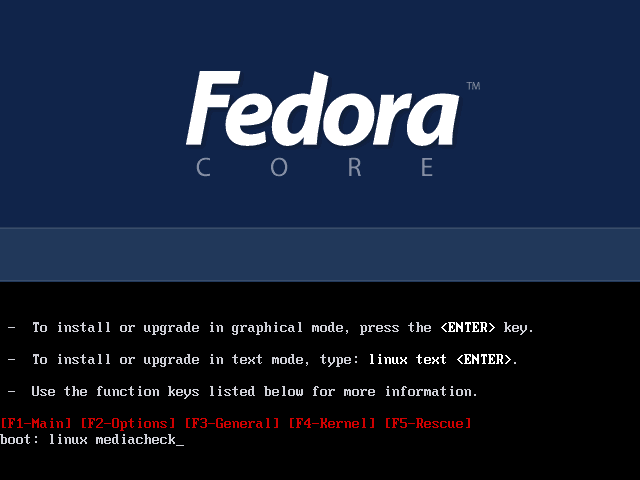 Test the Fedora Core 4 installations media using Linux Media Check - Linux Fedora Core Project. To avoid any problem during the installation process due to the bad installation media CD or DVD, it's good idea to check / test your Fedora Core installation media before you proceed with the installation process. 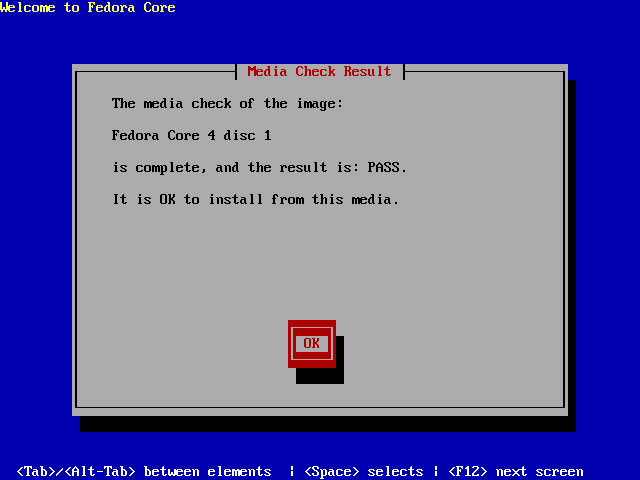 The article below show the step by step on performing the mediacheck for the Fedora Core 4 installation media. Best Practice: Checking the CD-ROM data integrity checksum can avoid a major problem during installation process. This procedure will ensure that the disk was burn correctly and prevent installation failures related to bad media. To test the checksum integrity of the DVD/CDs, boot computer and point the boot sequence to boot the DVD/CDs. 3. 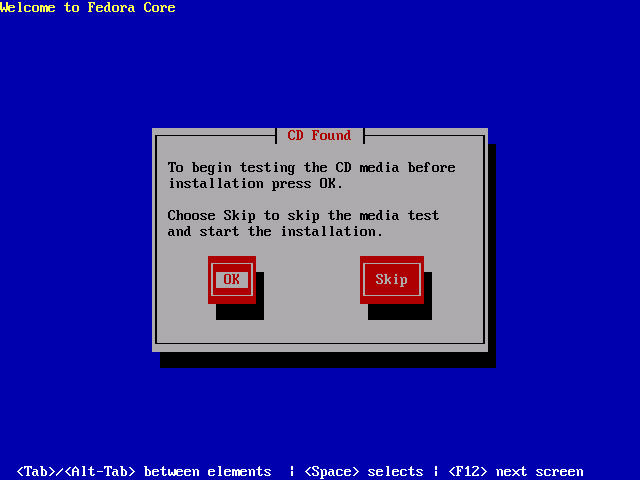 To start testing all the Fedora Core 4 installation CDs media, press the [OK] button. You can choose to skip the media test and start the installation by press the [Skip] button on the "CD Found" screen. To begin testing the CD media before installation press OK. Choose Skip to skip the media test and start the installation. 4. Press [Test] button, to start the test on the disk number 1 that already in the CD-Rom drive.. Choose "Test" to test the CD currently in the drive, or "Eject CD" to eject the CD and insert another for testing. 5. Media Check - Checking the "Fedora Core 4 disc 1"
6. 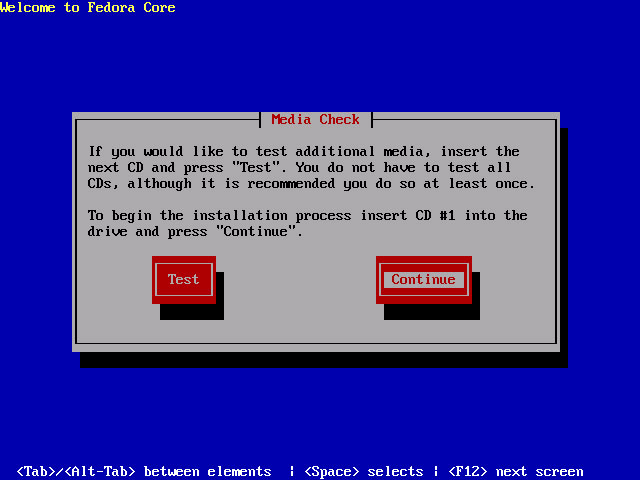 After finish checking the disk, Media Check display the test result of "Fedora Core disk 1", then press [OK] button to return to Media Check. - is complete, and the result is: PASS. - it is OK to install from this media. 7. 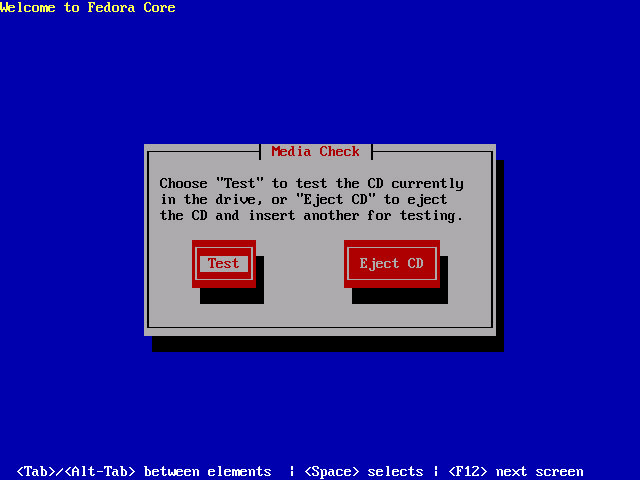 Test the Fedora Core 4 disk number 2, insert the Fedora Core 4 installation CD number 2 on the CD-Rom drive and then press [Test] button. Media Check - If you would like to test additional media, insert the next CD and press "Test". You do not have to test all CDs, although it is recommended you to do so at lease once. To begin the installation process insert CD #1 into the drive and press "Continue"
8. Media Check - Checking the "Fedora Core 4 disc 2"
9. 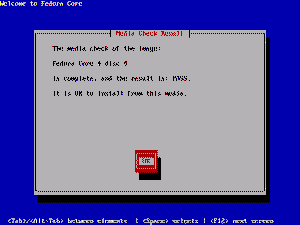 After finish checking the disk, "Media Check" display the status of test result on "Fedora Core 4 disk 2", then press [OK] button to return to Media Check. 10. To test the Fedora Core 4 disk number 3, insert the Fedora Core 4 installation CD number 3 to the CD-Rom drive and then press [Test] button. 11. Media Check - Checking the "Fedora Core 4 disc 3"
12. After finish checking the disk, "Media Check" display the status of test result on "Fedora Core 4 disc 3", then press [OK] button to return to Media Check. 13. 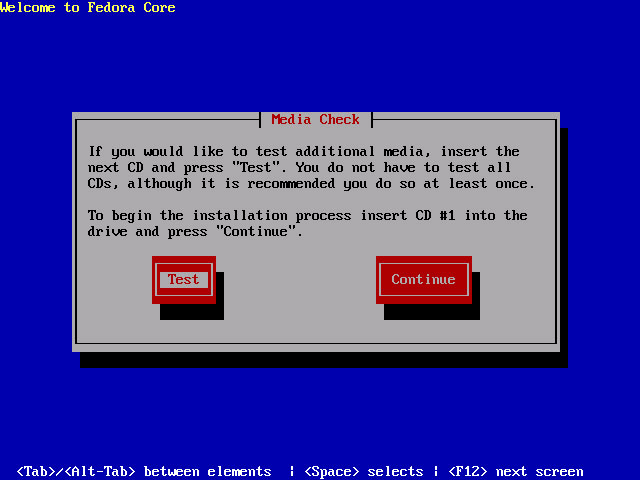 Test the Fedora Core 4 disk number 4, insert the Fedora Core 4 installation CD number 4 to the CD-Rom drive and then press [Test] button. 14. Media Check - Checking the "Fedora Core 4 disc 4"
15. After finish checking the disk, "Media Check" display status of the test result on "Fedora Core 4 disc 4", then press [OK] button to return to Media Check. All Fedora Core 4 screenshot publish here are for educational purpose only. Suggestions and comments to improve this page are welcome. Keywords: linux mediacheck, media check, mediacheck screenshot, check fedora core disk, fedora Core 4 installations media, using linux media check, check linux installation cd, media check screenshot, check installation media.